Photograph courtesy of Gryffindor, Wikimedia Commons, 2008. Formed in 1898 by the consolidation of Chicago-, New York-, and California-based bakeries, Nabisco (shortened from its original name, the "National Biscuit Company") represented the transition from home baking to mass-production to nationally-marketed cookies and crackers. The group of buildings that now contains the upscale Chelsea Market, formerly housed Nabisco's two-million sq ft factory headquarters comprised of twenty buildings and occupying a full city block from 15th to 16th Streets between Ninth and Tenth Avenues. Interconnected footbridges, vertical conveyors, and ovens animated its vertical factory operation. The earliest surviving building built in 1892 for the New York Biscuit Company was a six-story red-brick Romanesque-Revival structure that housed company offices on the top floor, stock storage on floors four and five, baking ovens on floors one to three, and flour storage in the basement. A major alteration to the train system in 1904 routed a New York Central Rail Road (NYCRR) siding into its open courtyard, establishing direct access to national and regional markets. By 1931, the site was the world's largest baking complex. 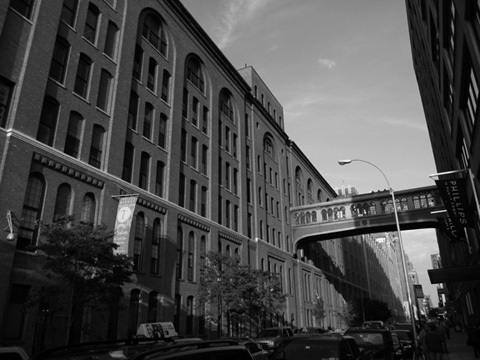 With the construction of the elevated High Line in 1934, the factory's southwest corner was replaced with a 5-story shipping and manufacturing building, featuring a second-story connection to the NYCRR. In 1995, the complex was transformed into Chelsea Market, an urban interior mall housing offices and studios/office spaces for on upper floors, and gourmet shops on the ground floor. The integrated elevated train tracks have been revitalized as part of the High Line Park.